The versatile 62353 hand held electrical medical safety analyser now available from Rigel Medical combines the benefits of an automatic and manual tester with advanced data logging to provide improved asset management capability. It is the first dedicated IEC 62353 safety analyser offering automatic sequencing, onboard data storage and data entry in a lightweight, easy-to-carry enclosure. Improved battery power provides extended operating life while the instrument’s lightweight feature makes it extremely practical and easy-to-transport from site-to-site. Meeting all the requirements of IEC 62353, the standard for in-service and after repair testing of medical electronic devices, the Rigel 62353 can store up to 10,000 test records, customised routines, visual inspections and performance tests which can be downloaded to and from a PC. 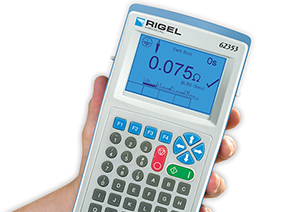 Visit the Rigel 62353 Hand-held Electrical Safety Analyser product page for more information.